I am a student at Acton Academy and I have learned lots from this book. I think it explains the forms of poetry very well. The illustrations are great also. Thank you Paul Janeczko and Chris Raschka. The title is completely true. Here is my poem.Hickory Dickory DockI lost my sock. This award winning book was my choice read based on the unique writing style. This author, chose to write a story about the rules of different forms of poetry. For readers who are just learning about poetry, specifically how to write it, this book is an excellent example of how to do that. Examining the rules of different (29 to be exact) poems, readers have the ability to analyze what makes each poem unique. The illustrations in the text are unique to each poem and were created through oil pastels and water color paints. Each illustration, allows the reader to interpret its significance to the poem on the page. The illustrations are abstract and have a surrealism element to them. There are also small illustrations at the top of each page that have a direct correlation to the type of poem chosen. As a reader, I often needed to think about the example poem shown in order to determine how the small picture played a role. It is clear, that if readers do not read the introduction to the story, that it would be overlooked.I highly recommend this book for any age/ grade level due to it's unique ability to teach poetry. Teachers can utilize this text if they would like an example of a specific poem. Readers also do not have to go in any particular order, which is a non- traditional way of reading a story. I think the illustrations make this book inviting for readers of all ages as well. My dad loved music, but he couldn’t sing. “He can’t carry a tune in a bucket” my mom used to say. Yet, he found his musical voice through poetry. He read it, memorized hundres of poems in his life and even published two books of his own work. Poetry has always been an important part of my life and though I do not have my father’s gift for writing it, I do share his love for it. 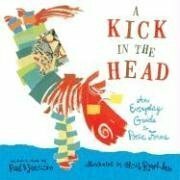 A Kick in the Head written by Paul B. Janeczko and illustrateted by Chris Raschka is a great poetry book. Janexzko even writes a poem to explain what poetry is!The book contains the authors own work but also gives examples of all kinds of different poetry by authors from Ogden Nash to William Blake. With it’s vivid illustrations, this is a great way to introduce young readers to all kinds of poems. It contains funny verse as well as work that is steeped in metaphor. This book contains some great vocabulary, beautiful symbolism and vivid illustrations that get your creative juices flowing. For me, the best part about this book is that it shows the reader that anyone can write a poem—it may not be a Shakespearian sonnet, but anyone can create something that has magical and musical meaning. A great work for kids ages 5-12 to be sure, but I think this would also be useful for older children and adults who want to remember why poetry is cool! A Kick In The Head selected by Paul B. Janezcko is an interesting book containing examples of 29 poetic forms. The poems contained are of a good quality although they don’t always strictly stick to their forms. This is a book that could be used with older KS2 and even Secondary children however it is not the easiest book to just dip into and understand a particular poetic form and although the temptation maybe to do this it is beneficial to read from beginning to end. The book could be used as quick reference for different poetic forms should you wish to base a lesson around one of them though I feel it would have been useful to have more than one example for each style as this would help children understand them easier. I love this book as am by no means a poetry expert and feel this is a great introduction. I do think some children may struggle with it a due the limited examples for each style and the heavy use of poetic terminology. Wonderful illustrations and easy descriptions. Grade range: 2-6Genre: PoetryThis is a super awesome book for exemplifing the different types of poetic styles. This could be fun for older students to look through, and for you to use with younger students to help them learn how to write different types of poetry, such as an acrostic.A wonderful read! I would recommend! A book about different forms of poetry. Examples and definitions of various poems are included. I used this book as I’ve taught poetry lessons. The definitions are easily understandable for students and they’ve enjoyed the examples given. I used TeachingBooks.net to get more information on this book. Cover and title best bits. If you're determined to teach the subject, it's not a bad book. But I, personally, despise most of Raschka's work, and was not overly impressed with most of the selections. So much fun! The poems included are wonderful and informative as to the types of poetic form. Can’t wait to share with my class! Includes samples of poetic forms you may almost remember, and some you may never have heard of (clerihew? aubade?). Pair with "A Poke in the I" from the same creators. I did not like this book because it was all poems. I don't know much about poetry, but this was a great way to learn about different forms! This can be used for any age!! Read for grad school for my Lit & Resources for Children. Grades: 1st-4th Summary: I thought that this book was great for poetry and learning in a classroom. It is colorful, fun, and amazing. It has a variety of poetry from haiku to ballad. It is full of engaging colors and stories that could draw in a variety of ages. It also expresses all of the different kinds of poems that are out there. Review: I think this a great book to have in your classroom. The children would love the colorful illustrations and the funny words. I really enjoyed all the various components that were found in this book. In Class Use: This book could be used to introduce many topics of poetry. It shows a variety of rhyming and styles. This would be great to introduce a lesson on poetry or to have during a reading time or even just for the students to flip through and enjoy the pictures. Great book to learn about the different forms of poetry. Love the examples and the notes of the rules/format of the poems in the back of the book. Great guide to writing poetry. Sandra Carolina ArguetaApril 11, 2016ETEC Children's Poetry AnthologySelected by Janeczko, Paul B, Illustrated by Raschka, Chris. A Kick in the Head: An Everyday Guide to Poetic Forms. Candlewick Press, Cambridge, Massachusetts,2005In this book, I was able to better understand, to a degree, the most popular and common structures and forms of poetry used by poets in a really fun way. In this beautifully illustrated book the rules governing the forms and structures of poems is explained. Janeczko selected popular poems that fit the form being featured on each page. The poem is written strategically on the spread of the page, then the rest of the space has beautiful detailed art work reflecting the idea or narrative. Rascha illustrates the poems and tells the readers the stories with them in a way that evoke a powerful emotional response. The colors heighten our awareness to the ideas being delivered. The art work reminds me of pieces done by Jean-Michel Basquiat: the mixed media and abstract faces and geometric like forms. Water colors and fabrics and cloth, feathers and torn wall paper seem to be the materials used. The pictures in this book were definitely a blend of the poetry they represent because they intensify the idea and the mood of the lovely poems. He also places little symbols “pictorial clues” representing the poem’s structure as a review of the “rules” of this poem on the corners of the pages. The book begins with a general introduction of the rationale for having "bendable" rules when poetry is written. In addition, Rhyme and schemes are explained.The first explanation is the structure of a couplet: “The Mule” By Ogden Nash. There is no greater truth, I guess: In the world of mules There are no rules.The rest of the anthology of poems explains more complicated forms, structures and schematics. The poems are appropriate for young adults as well as adults,some of them will be familiar and some more obscure. My favorite one, which I thought was a song by Cat Stevens called “Morning has Broken” is actually an Aubade poem by Eleanor Farjeon that celebrates the coming of a new day. I really learned a lot with this book. An Everyday Guide to Poetic FormsThere are many poetic forms and A Kick in the Head, An Everyday Guide to Poetic Forms describes many of these forms. It is a collection of many poems written by different poets and selected by Paul B. Janeczko. The illustrations that accompany each poem are by Chris Raschka. The whole book has a fun vibe and yet it is very informative about poetic forms. The jacket of the book has an acrostic (when the poem is read downward, the first letter of each line forms a word which is usually the subject of the poem) poem which is used to describe the entire book, poetic forms. The author picked great examples for each poetic form. For concrete poems or “shape poems” the words of the poem are arranged as to form the subject of the poem. In the poem “Amelia Cramped” by Monica Kulling the words are arranged as to form an airplane. The illustrations are simple, but help bring out the subject of each poem. At the end of the book there are pages with all the poetic forms that are included in the book, and they have a little bit more of a description.This is a great book because it has twenty-nine poetic forms and Paul B. Janeczko selects great poems that represent each one. It is a good book for teachers to have as reference for poetic forms. This book can also be used as a tool when teaching intermediate grade children to middle school children poetic forms and how to identify them. Another way a teacher can use this book is when they children to write their own poems in a specific form. Or even for kids to explore the different forms and write poems in their favorite forms. It is a good book to include in the classroom library as well because it can add to the variety of books. It also can just spark a poetic interest in a child. This is a good book to have just as a reference to poetic forms. It can be used as a tool in the classroom or just as a reference for young future poets. A Kick in the Head: An Everyday Guide to Poetic Forms has twenty-nine different forms of poems creatively written and illustrated. On each page there is a poem and an illustration, as well as the type of poetry form in the upper corner of the pages. Below the pictures, the author gives a description of the poetry form. Some of the poems were more difficult to comprehend then others. While some were vague and uninteresting, depending on the form, others were creative and fun to read. The poems vary in both form and topics. My personal favorite is “A Kick in the Head” by Joan Bransfield Graham on page 39. This poem is written out in the shape of a person kicking. It is creative and eye-catching.This book provides the readers with various forms of poetry as well as explanations. You can find notes on the different forms of poems in the back of the book which provide further information of each form. This book is colorful and eye-catching, as well as informative for readers. This book can be a helpful source in teaching poetry to students. When the students are learning how to write the different forms of poetry, the students can use this book as a resource for examples of each form.I found the introduction to be attention grabbing. It made the connections of rules of poems to rules of a baseball game. It shows how rules can make poems more challenging and exciting. I also found it interesting that the author is both a poet and a teacher. This makes for a good source for teachers to use when using this author’s poetry books such as this one. All together, I found this book to be a creative tool for poetry. It can be helpful for both teachers and students. It captures the reader’s eye and guides them through the different forms of poetry. I thought this book of poetry was an alright collection. I’m not sure that I would like it if I were a young child, but then again, I wasn’t big into poetry when I was young either. Some of these poems are hard to follow, but sometimes I think that is the point. It is not a bad thing not to understand a poem right away because it gets the reader thinking. There were a few poems that I really liked out of this book because I thought they were either funny or interesting. My first example is “Riddle Poem,” by an anonymous person. The poem is a riddle, which is very clever, and the answer is tucked into the picture. At first I didn’t know what the answer was, but it made perfect sense after I read it again! Another poem I liked was “Amelia Cramped,” by Monica Kulling. It made me think of my days when I had to write concrete poems, which I really enjoyed. I also liked the line that read, “theicecakedwings”. It was the wing part of the picture and it really gave me a clear idea of what the plane looked like. This book reminded me of a book of poetry I read to a first grader once. I don’t remember the name of the book, but it had a whole collection of poetry in it, only it was a little more suited for first grade. This book had a description of every type of poem that was in the book. It was a helpful little guide, but almost an annoyance to keep having to find out what kind of poem I was reading. I think this would be a good book for teachers to have while teaching a poetry unit. It could be a guide to show kids different kinds of poems and how to form them. I wonder what grade level this book would be good for and what audience the author had in mind. The book also had nice pictures on each page! This book includes multiple poems which are used as examples of all the different types of poems, like a haiku, limerick, acrostic, etc. Not only does it share great poems written by many different authors but it also provides the reader with knowledge on what each type of poem is, and how to write one. This could be considered an information text as well because of that. I really enjoyed this book, which is surprising to me because I am not a fan of poetry. I loved the creativity and how the author chose to make it informational for the reader, without over powering with facts and definitions which can sometimes make a book boring. This was not the case. The poems that were chosen were simple, random, and interesting. The book is very organized, with a table of contents, headings, and notes in the back of the book providing additional information. As well, the author kept each page organized the same way. It identified the type of poem in the corner, with the title and author in bold, and wrote in small font at the bottom, the definition of each type of poem. All of these things made it really easy for the reader to find what they were looking for. When it came to the illustrations, they were done brilliantly. They never overpowered the text but often added to the poems, making them even more interesting. The illustrator used a lot of color, and against the white background it made it "pop". In my opinion, the illustrations really made the book more entertaining. I love the simple small font text, with the outrageous images surrounding. It was a great mix. I would definitely recommend this book to everyone. I am not exactly sure how I feel about this book. It was informational in the fact that with each form of poetry there was an explanation at the bottom of the page that described the specific rules for that particular poem. This was very helpful in allowing me to read the poetry in the correct way. On the other hand, some of the poetry was a little difficult to understand and figure out. It also did not help that several of the poems did not follow the rules exactly. Some of the poetry was hard to relate to and figure out the meaning, but I guess not all poetry is written to have meaning. One of my favorite poems was "The Cow's Complaint" by Alice Schertle. This poem was easy for me to follow considering I have grown up on a farm with cows and also understand the concept of "the grass is greener on the other side." One thing I really liked about this book was the illustrations. They were very interesting and colorful. The images were composed of many different materials including paint, feathers, fabric, etc. This really enhanced my reading of the poetry. I also enjoyed the "Notes on the Forms" of the poetry that was located at the back of the book. I think this book could be very useful in a classroom when working with children and different forms of poetry. It might be neat to read the Haiku poem for the class when they are going to be working on Haikus for example, but I did think it was a lot to take in if you were to just sit and read all of these different forms of poetry in one sitting. Poetry anthology? yes. Informational book? Yes. Poetry Reference book? Yes. A Kick in the head is an excellent book that gives the reader 29 different forms of poetry. These forms vary from the very simple couplet, and go all the way until the much more complicated pantoum poem. The poems, selected by Paul B. Janeczko, are by a wide variety of authors. He supplies one poem for each form of poetry given. The illustrations, by Chris Raschka, are quirky and colorful and done in watercolor, ink, and torn paper. Each page, tells the reader what form of poem is being discussed on that page. Then it gives the sample poem followed by the title and author of the poem. Also, somewhere on the page, in very small type is a sort of definition of that form of poetry. The final pages of the books are notes on the different forms of poetry discussed in the book, and in the beginning there is a table of contents. All of this make the book a book that would be a great reference book for a teacher trying to teach the different forms of poetry to the class. The students could also use this book to easily look up information on the types of poems and even an example. Besides teachers, I would also recommend this book to 3rd through 6th graders. Besides teaching different forms, it is a great collection of poetry by a great selection of authors. I think A Kick in the Head is a good introductory book to poetry. It captures your eye with a patchwork art style. It would seem as if the illustrator glued together scrap sheet to create figures. They used warm and bright shades of blue, green, yellow and black. It would al so seem like pattern scraps where used to create a dimensional element. Some of the pictures even looked fuzzy. The shapes of the picture were abstract; however you are able to determine the artist intent. Although I recommend this book for elementary aged students, It was a great reference for me in helping me lean the different forms of poetry. The book begins with a list of rules for poetry. I like the way it puts a funny twist to lighten the topic and it also makes it easy to understand. The book is a compilation of the different types of poems. For example, Couplet, Tercet, Haiku, Tanka, Limerick, Sonnet, just to name a few. It even includes the samples of types I’d never heard – Elegy, Tercet, and Roundel. The book ends giving the reader notes on each of the different forms. This was very helpful. I would recommend this book to any person needing a clear definiton and examples on the types of poems and their rules. I'm posting this for Kelsey:book of poems. There were all different sorts of poetry styles the author included in it like limerick, haiku, sonnet, and even couplet. In the beginning of the book, the author Chris Raschka includes 29 of the rules for each different type of poetry. Each poem had a different feel and emotion to them. I think that kids would really respond well to some of the emotions that were portrayed.I found the illustrations to be amazing. The artwork was extremely colorful and patterned. The illustrations almost looked like collages of some sort to me. I even found myself excited to turn to the next page to see what picture was next. It was nice to be able to look at the picture and get a visual for the poem.After reading this book, I thought it would be a wonderful aid to help me teach students about the different forms of poetry. Each poem has a description, and that would help kids to read the description and then have an example that is fun and easy to read. The colors would be sure to entice my students, and I really look forward to including this into my future teaching. A Kick in the Head: An Everyday Guide to Poetic Forms, was an adorable book of poems. There were all different sorts of poetry styles the author included in it like limerick, haiku, sonnet, and even couplet. In the beginning of the book, the author Chris Raschka includes 29 of the rules for each different type of poetry. Each poem had a different feel and emotion to them. I think that kids would really respond well to some of the emotions that were portrayed. I found the illustrations to be amazing. The artwork was extremely colorful and patterned. The illustrations almost looked like collages of some sort to me. I even found myself excited to turn to the next page to see what picture was next. It was nice to be able to look at the picture and get a visual for the poem. After reading this book, I thought it would be a wonderful aid to help me teach students about the different forms of poetry. Each poem has a description, and that would help kids to read the description and then have an example that is fun and easy to read. The colors would be sure to entice my students, and I really look forward to including this into my future teaching. Paul B. Janeczko Chris Raschka - Paul B. Janeczko is a poet and teacher and has edited more than twenty award-winning poetry anthologies for young people, including STONE BENCH IN AN EMPTY PARK, LOOKING FOR YOUR NAME, SEEING THE BLUE BETWEEN, and A POKE IN THE I, which was an American Library Association Notable Book.